Perinatal brain injury is the leading cause of subsequent neurological disability in both term and preterm baby. Glutamate excitotoxicity is one of the major factors involved in perinatal hypoxic-ischemic encephalopathy (HIE). Glutamate transporter GLT1, expressed mainly in mature astrocytes, is the major glutamate transporter in the brain. HIE induced excessive glutamate release which is not reuptaked by immature astrocytes may induce neuronal damage. Compounds, such as ceftriaxone, that enhance the expression of GLT1 may exert neuroprotective effect in HIE. We used a neonatal rat model of HIE by unilateral ligation of carotid artery and subsequent exposure to 8% oxygen for 2 hrs on postnatal day 7 (P7) rats. Neonatal rats were administered three dosages of an antibiotic, ceftriaxone, 48 hrs prior to experimental HIE. Neurobehavioral tests of treated rats were assessed. Brain sections from P14 rats were examined with Nissl and immunohistochemical stain, and TUNEL assay. GLT1 protein expression was evaluated by Western blot and immunohistochemistry. Pre-treatment with 200 mg/kg ceftriaxone significantly reduced the brain injury scores and apoptotic cells in the hippocampus, restored myelination in the external capsule of P14 rats, and improved the hypoxia-ischemia induced learning and memory deficit of P23-24 rats. GLT1 expression was observed in the cortical neurons of ceftriaxone treated rats. These results suggest that pre-treatment of infants at risk for HIE with ceftriaxone may reduce subsequent brain injury. Perinatal hypoxia and ischemia cause serious complications . Preterm and sick infants are at high risk for brain injury and neurodevelopmental problems . The hypoxia and ischemia induced brain injury in neonates is defined as hypoxic-ischemic encephalopathy (HIE) which is the leading cause of neurological sequelae in premature infants. The pathophysiology of HIE includes energy failure, intracellular calcium accumulation, glutamate and nitric oxide neurotoxicity, lipid peroxidation, free radical formation, and inflammation [3, 4]. As the survival rate of premature infants increased since 1990s, increased risk of significant neurodevelopmental impairment was also noted . Intervention strategies to HIE include hypothermia and erythropoietin therapy, which reduce neurological damage in animal models of HIE . In recent human studies, therapeutic hypothermia demonstrated a significant reduction of the risk of death and neurological impairment at 18 months of age . But, there was no significant difference in the severe neurodevelopmental delay in the survivors. Further studies are warranted to improve the neurological sequelae after HIE damage. Five subtypes of glutamate transporter (excitatory amino acid transporters; EAAT 1-5) have been characterized in human. In other mammalian species, GLAST, GLT1, and EAAC1 have been found to correspond to human EAAT1, 2, and 3, respectively . The glutamate transporters are responsible for the rapid removal of glutamate from the extracellular space . GLT1 (or EAAT2), expressed mainly in the glial cells, plays a principal role in removing the excessive glutamate from the extracellular space [9, 10]. Some pathological conditions have been associated with alteration in EAAT2 expression, such as amyotrophic lateral sclerosis , Alzheimer's disease , and Huntington disease . Interventions targeting on the glutamate transporter have been conducted [14, 15]. Several antibiotics were found to upregulate significantly GLT1 expression. Ceftriaxone, a third generation cephalosporin, was one of the antibiotics found to exert neuroprotection by increasing GLT1 expression in an animal model of amyotrophic lateral sclerosis . 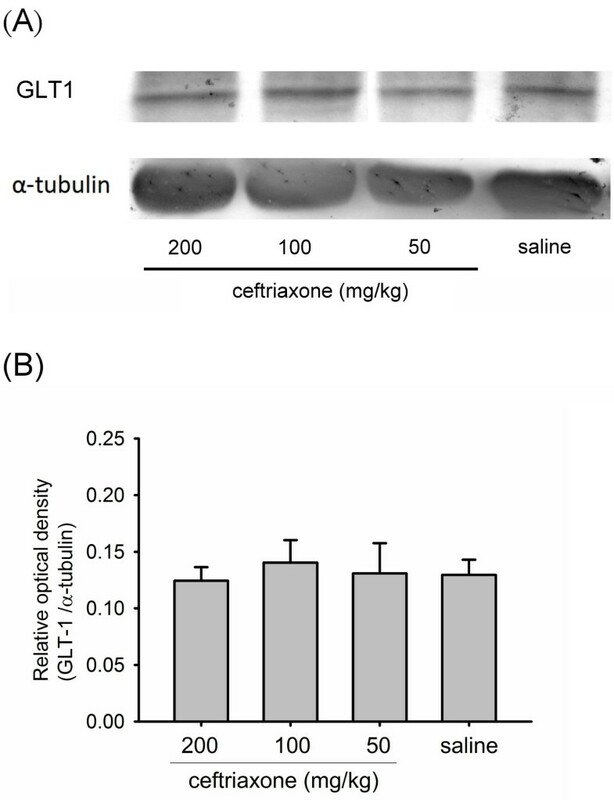 Ceftriaxone also exhibited beneficial effects in in vitro and in vivo model of stroke [16, 17]. However, there is no report investigating the effects of ceftriaxone in neonatal HIE. In this study, we used a rodent model of neonatal HIE with unilateral carotid artery ligation and subsequent exposure to 8% oxygen for 2 hrs on postnatal day 7 rats (the day of birth was designated as P0). The P7 neonatal rat is comparable to the 34 weeks old human fetus . Different dosages of ceftriaxone were used in these rat pups to clarify if ceftriaxone treatment could offer neuroprotection against the hypoxic-ischemic brain injury. Our results indicate that pretreatment with ceftriaxone in neonatal rats can reverse hypoxic-ischemic induced morphological and functional alterations. This study was approved by the Institutional Animal Care and Use Committee of Tzu Chi University. Pregnant Sprague-Dawley (SD) rats were housed in individual cages with 12 hrs light/dark cycle at 22 ± 2°C with free access to food and water. After normal delivery, the size of the litter was adjusted to 10 male rat pups to eliminate the gender difference of neonatal HIE . The neonatal rat model of HIE as described previously  was followed with minor modifications. Briefly, a less than 1 cm longitudinal midline incision of the neck was performed under ether anesthesia on P7 rats. The left carotid artery was exposed and permanently ligated with 4-0 surgical silk. The surgery lasted less than 5 min. Animals with excessive bleeding were excluded. The rat pups were returned to home cage with their dam for 1 hr followed by exposure to hypoxia (92% N2 + 8% O2) for 2 hrs by placing them in an airtight chamber partially submersed in a 37°C water bath. At the end of 2 hrs hypoxia, the pups were returned to their dam again for recovery. Ceftriaxone (Sigma Chemical Co, St. Louis, MO) was dissolved in sterile water and dosage of 50, 100 or 200 mg/kg was given intraperitoneally to three different groups of randomly assigned rats. Rats were pre-treated daily with ceftriaxone for 2 days followed by a third dose given 1 hr before ligation and hypoxia. These animals were assigned to the drug treatment group. Animals in the control or normal group were treated with the same volume of saline. Similar to previous report , the control animals received sham operation that consisted of left carotid artery exposure without ligation and then exposed to hypoxia for 2 hrs. Rats were administered intraperitoneally an overdose of 10% chloral hydrate on P14, and perfused transcardially with 20 ml ice-cold saline followed by 20 ml 4% paraformaldehyde in 0.1 M phosphate buffer (pH 7.4). Brains were removed and fixed in 4% paraformaldehyde in 0.1 M phosphate buffer overnight at 4°, transferred sequentially to 15% sucrose and then 30% sucrose in 0.1 M phosphate buffer until the brains sank for cryoprotection. Brains were then embedded in O.C.T (Sakura, Torrance, CA) and stored at -80°C for immunohistochemistry and immunofluorescence studies. The brains were sectioned coronally into 10 μm slices with a cryostat (Leica CM3050, Leica Instruments, Nussloch, Germany) at -20°C to -22°C. Brain sections were mounted onto superfrost plus slides (Menzel Gläser, Braunschweig, Germany) and stored at -20°C until use. Coronal brain sections corresponding to plate 18 and 31 according to the rat brain atlas  were examined. The selected brain sections were stained with 0.5% cresyl violet acetate (Sigma, #C1791). We used a standard histological scoring system for evaluating the rodent model of HIE . Brain sections were scored according to: 0 = no detectable lesion, 1 = small focal area of neuronal cell loss, 2 = columnar damage in the cortex involving the layers II-IV or moderate neuronal cell loss, and 3 = cystic infarction and gliosis. Eight brain regions (hippocampus: CA1, CA2, CA3, dentate gyrus; anterior and middle regions of cortex; striatum and thalamus) were evaluated, scored, and the scores summed to yield the final scores, ranging from 0 to 24 for each animal. Conventional procedures were followed with some modifications. Briefly, brain sections were rehydrated with decreasing ethanol concentrations (100%, 95%, 75%, 50%) for 5 min each and washed with phosphate-buffered saline (PBS). Background staining was blocked using protein block (NovoLink™ Polymer Detection System, Novocastra, Newcastle Upon Tyne, UK). After washing with PBS, sections were incubated with primary antibodies with the following dilution ratio: anti-MBP (1:200, sc-13914, Santa Cruz Biotechnology Inc., Santa Cruz, CA), and anti-EAAT 2 (1:100, #3838s, Cell Signaling Technology, Danvers, MA). Sections were treated for 2 hrs at room temperature with horseradish peroxidase-conjugated secondary antibodies (1:1000, sc-2352, Santa Cruz) for MBP (myelin basic protein), or incubated with NovoLink™ Polymer for 30 min for EAAT2. Substrate 3, 3'-diaminobenzidine (DAB, Dako, Denmark) was added for less than 5 min. Slides were examined with a computer-assisted Olympus BX51 microscope and images were taken with an Olympus DP72 microscope digital camera. Cliff avoidance test was performed on P14 rats for assessing the integrity of exteroceptive input and locomotor output . Rats were placed in the edge of a platform (30 cm × 30 cm × 30 cm) with forepaws and chest extending over the edge. The latency of the rats to turn away or withdraw from the edge was recorded. If the pups fell from the platform or did not response within 60 seconds, the latency was recorded as 60 seconds. Negative geotaxis test examines the sensorimotor function of neonatal rats . The P14 rat pups were placed on a 30-degree inclined plate with rough surface. Their heads were facing downward. The latency to turned 180 degree to an upward direction was recorded. The maximum duration of recording was 90 seconds. The rotarod test was used for evaluating the motor and coordination performance in animals . The test was performed on P21 rats with the rolling rate of 5 rpm. Rats were placed on the rod and observed for 3 min. The duration of rats holding on the rod without falling down was recorded as the day one trial. On the following day P22, rats were placed on the rod again with the rolling rate of 5 rpm. The duration of holding on the rod was recorded. Step-down passive avoidance test was used to measure the learning and memories in animals . Rats were place in a 30 cm × 30 cm × 30 cm black acrylic chamber. The floor was made of paralleled 2 mm in diameter and 1 cm apart from each other stainless steel rods. The floor of steel rods was connected to an electric shock generator. At the center of the floor, an acrylic board (15 cm × 15 cm × 2.5 cm) was placed and served as a safe platform on the floor. In session one, each animal (P23) was placed initially on the safe acrylic board. When rats stepped down to the metal rods, they received an electrical foot shock (1sec, 0.5 mA). Rats stepped down and up on the safe board, and the latency of stepping down till the rats stayed on the board for 2 min were recorded. Session two (P24) was conducted one day later. Rats were placed on the safe board and the latency of each animal stayed on the safe board before starting to step down to the metal rods was recorded as retention time. If the animal stayed on the safe board without stepping down to the metal rods, the latency is recorded as 2 min. Following the latency of staying on safe board, the duration of stepping down till the animal again stayed on the board for 2 min was recorded. If the animal stayed still on the safe board after placing on the safe board for more than 5 min, the duration of stepping down was recorded as zero. Conventional methodologies were used. Particulate fractions from P7 brain homogenates were solubilized with protein extraction solution (PRO-PREP™ protein extraction solution, iNtRON Biotechnology Inc., Seoul, Korea). After 30 min incubation, the sample was centrifuged at 13,000 rpm (Allegra™ 21R centrifuge, Beckman Coulter, Palo Alto, CA) at 4°C for 10 min. The supernatant consisted of the solubilized membrane portion of tissue. Primary antibody, anti-EAAT2 (1:1000, #3838s, Cell Signaling Technology Inc., Danvers, MA), was used. Expression of α-tubulin (1:2000, sc-8035, Santa Cruz) was used as internal standard. Immunocomplexes were observed with enhanced chemiluminescent detection. P14 post HIE rat brain tissue was evaluated with in situ apoptosis detection kit (NeuroTACS™ II; R&D Systems, Minneapolis, MN) as recommended by the manufacturer. Brain sections corresponding to plates 31 of the rat brain atlas  were chosen for evaluating the hippocampal neuronal apoptosis. Hippocampus (CA1, CA2 and CA3) ipsilateral to carotid artery ligation was examined and the number of apoptotic cells was calculated under 200X light microscope. TUNEL positive cells were counted in 3 separate fields of CA1, CA2 and CA3 areas and summated for each animal. Image J of NIH was used for densitometric analysis of Western blots and MBP expression density in the external capsule between ipsi- and contra-lateral sides to the carotid ligation. All data were expressed as mean ± standard error of mean (SEM). Statistical comparison between groups was carried out using one way ANOVA or Student's t test. A p value of less than 0.05 was considered statistically significant. Figure 1 shows the Nissl staining of coronal brain sections from P14 rat after left carotid artery ligation and subsequent exposure to 8% oxygen for 2 hrs on P7. Panels A to D show representative brain injury score increasing from 0 to 3. Brain injury score was significantly and dose-dependently attenuated by pre-treatment with 3 different dosages of ceftriaxone 48 hrs prior to hypoxia-ischemia challenge (Figure 1E). Ceftriaxone at 200 mg/kg almost completely reversed the hypoxia-ischemia induced brain damage. 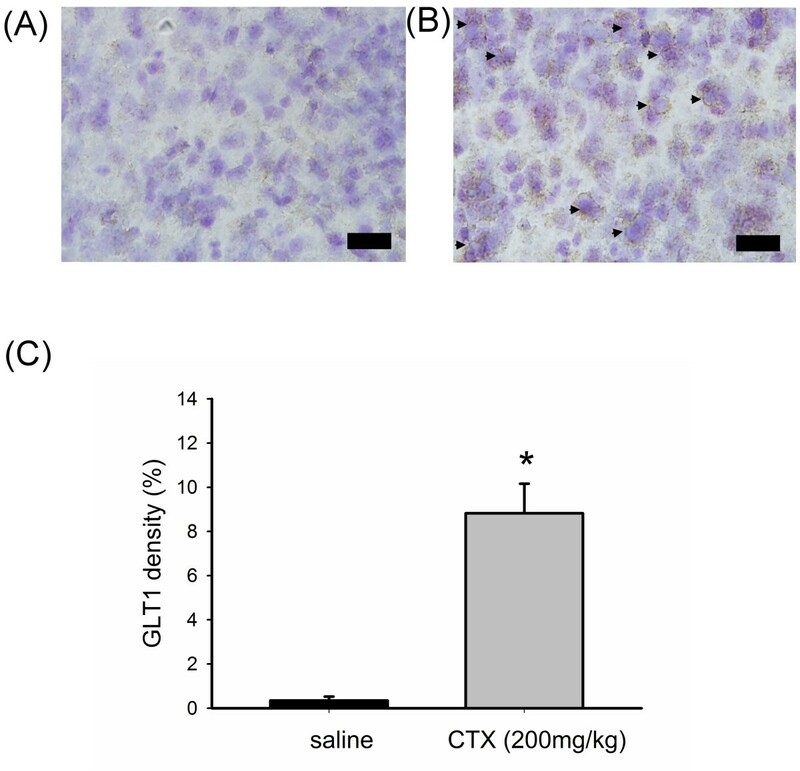 Ceftriaxone protected against hypoxic-ischemic brain injury in neonatal rats. A-D, Nissl stains of coronal brain sections from rat sacrificed on P14 after left carotid artery ligation and subsequent two-hour hypoxia on P7. Panel A, B, C and D represents two coronal brain sections illustrating the brain injury score of 0, 1, 2, and 3, respectively. E, Pre-treatment with ceftriaxone dose-dependently reduced brain injury scores and ceftriaxone with dosage 200 mg/kg significantly reduced the hypoxic-ischemic brain injury. one-way ANOVA, p = 0.0016 (n = 5 in each group); *: p < 0.05. Sham denotes animals received left carotid artery exposure without ligation and followed by 2 hrs of hypoxic challenge. Saline refers to hypoxic-ischemic animals received saline injection. White matter damage was also observed in this rodent model of hypoxic-ischemic brain injury. The white matter injuries included delayed pre-oliogodendrocytes maturation, loss of MBP, white matter cell death, and gliosis . Figure 2 shows the result of MBP immunostaining from P14 rat brain. 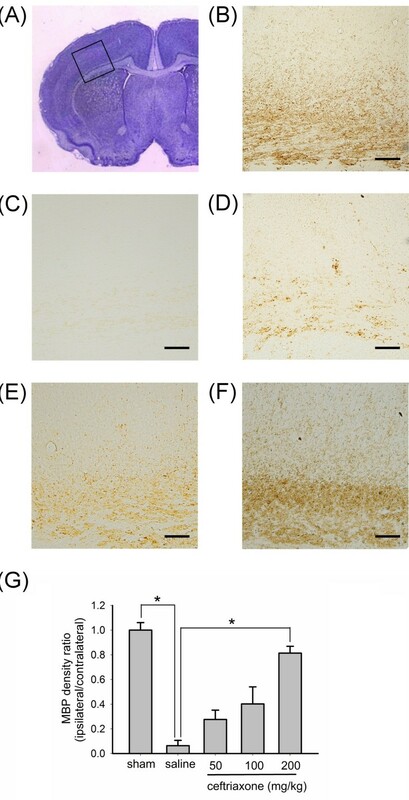 The inset in panel A shows the Nissl stain of external capsule region examined for MBP staining following ipsilateral ligation, and the enlarged photographs of MBP staining were shown from panel B to F. Large extent of MBP loss was observed in the P14 rat brain ipsilateral to the carotid ligation (panel C). Pre-treatment with ceftriaxone attenuated the MBP loss of P14 rats in a dose-dependent manner (panel D-F) with the highest ceftriaxone dose (200 mg/kg) almost completely rescued the white matter injury (panel F vs. panel B). The relative density of MBP in the ischemic-hypoxic side was calculated as the ratio of the MBP staining level in the ipsilateral side divided by that of the contralateral side of the same tissue section. Figure 2G shows quantitatively that pre-treatment with ceftriaxone significantly attenuated the MBP loss in P14 rats. Ceftriaxone attenuated hypoxic-ischemic white matter injury in neonatal rats. A, the rectangular inset indicated the area of analysis. B-F, immunohistochemical staining of myelin basic protein (MBP) in external capsule of left coronal brain sections from P14 rats. (B: sham operation, C: saline. D: ceftriaxone 50 mg/kg, E: ceftriaxone 100 mg/kg, F: ceftriaxone 200 mg/kg). scale bar = 100 μm. G, Ratio of MBP density (ipsilateral/contralateral) showed significant reduction in saline treated group. Ceftriaxone treatment dose-dependently attenuated the MBP loss and pre-treatment with ceftriaxone 200 mg/kg showed statistically significant rescue of MBP loss compared to saline group. one-way ANOVA, p = 0.0001 (n = 5 in each group); *: p < 0.05. The definitions for sham and saline groups are the same as those in Figure 1. TUNEL assay was performed in coronal brain slices of P14 rats. Hippocampal cell loss was noted after HIE (Figure 3B). The HIE induced hippocampal cell damage included both necrosis and apoptotic cell damage . 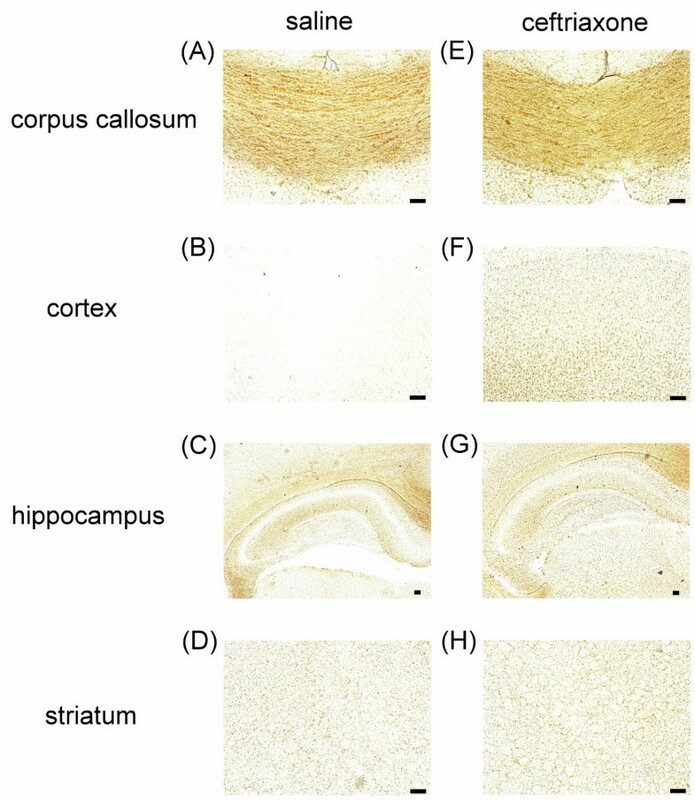 TUNEL assay was evaluated under 200X light microscope in 3 fields each of hippocampal CA1, CA2 and CA3 area, which were summed for each animal. Figure 3C demonstrates that pre-treatment with ceftriaxone reduced the TUNEL positive cells in hippocampal area in a dose-dependent manner with statistical significance found for 100 and 200 mg/kg dosages. Ceftriaxone reduced hypoxic-ischemic cell damage in the hippocampus. A, B, in situ cell death detection by TUNEL reaction in hippocampus of P14 rat brains counter-stained with hematoxylin. (A: ceftriaxone 200 mg/kg, B: saline, scale bar = 200 μm). C, the brains were evaluated under 200X light microscope in 3 separate fields each of CA1, CA2, and CA3 (total 9 fields) and summed for each animal. Pre-treatment with 100 mg/kg and 200 mg/kg ceftriaxone significantly reduced the TUNEL positive cell. one-way ANOVA, p = 0.0017 (n = 5 in each group); *: p < 0.05. Saline group refers to animals received hypoxic-ischemic procedures and saline administration. Based on the above morphological observations that pre-treatment with 3 dosages of ceftriaxone reversed the brain damage caused by ischemic-hypoxic insult, this treatment protocol was followed to evaluate its effects on several behavioral tests reflecting motor, learning, and memory functions. 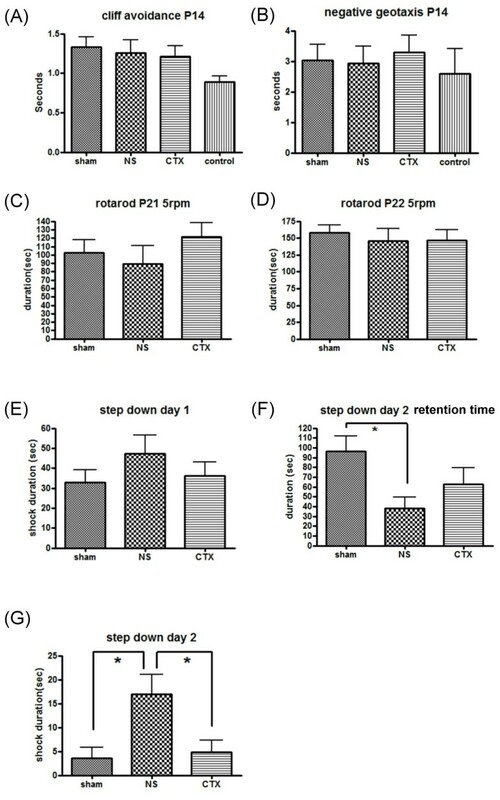 Figure 4 shows that ceftriaxone was without effect on cliff avoidance on P14 (Figure 4A), negative geotaxis on P14 (Figure 4B), rotarod test on P21 and P22 (Figure 4C and 4D) or the first session of step-down passive avoidance on P23 rats (Figure 4E). However, in session two trial of step-down passive avoidance (P24 rats), pre-treatment with ceftriaxone significantly reduced the duration of foot shock (Figure 4G). 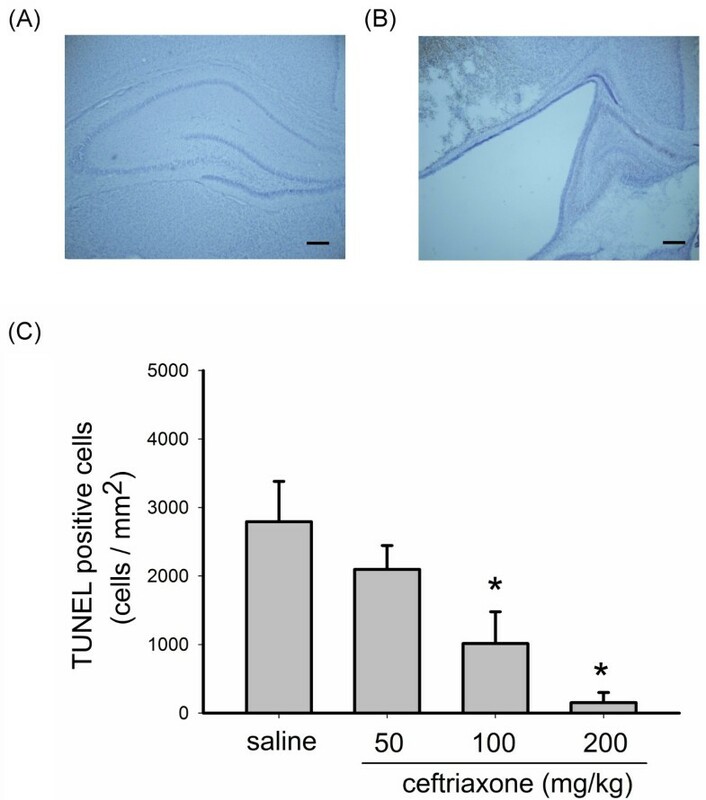 After pre-treatment with different dosages (50, 100 or 200 mg/kg) of ceftriaxone or saline, the membrane portion of P7 rat brain lysate was used for measuring the expression of GLT1 protein. A representative immunoblotting is demonstrated in Figure 5A. The expression of GLT1 was not altered by pre-treatment with ceftriaxone (Figure 5B). Pre-treatment with ceftriaxone did not increase GLT1 protein expression in neonatal rat brain tissue. A, GLT1 protein expression in P7 rat brain tissue following pre-treatment with different dosages of ceftriaxone and saline; B, statistic analysis showed no difference in GLT1 protein expression among these groups. one-way ANOVA, p = 0.95 (n = 5 in each group). Saline group, animals received hypoxic-ischemic procedures and given saline injection. We further examined if there was regional difference in the expression of GLT1 protein that could explain at least partly the neuroprotection mediated by ceftriaxone administration. Pre-treatment with 3 dosages of 200 mg/kg ceftriaxone was followed since it significantly reduced the histological and behavioral deficits. Immunohistochemial study with anti-EAAT2 antibody was carried out in brain slides to reveal the regional difference of GLT1 expression between ceftriaxone treated and saline group. Figure 6 demonstrates immunohistochemical staining of GLT1 in saline and ceftriaxone treatment groups. Each panel showed different regions of brain section (A,E: corpus callosum; B,F: cerebral cortex; C,G: hippocampus and D,H: striatum). Figure 6B shows that cerebral cortex from control P7 brain expressed little GLT1 protein. Figure 6F demonstrates that ceftriaxone pre-treatment, however, induced GLT1 protein expression in this area. After counterstained with Nissl stain, the GLT1 protein was found to be expressed in cortical neuronal cells (Figure 7B arrow). Image J was used to analyze the percentage of EAAT2 (GLT1) immunoreactive area of P7 rat cortex under 400X light microscope in saline and ceftriaxone pre-treated groups. Ceftriaxone pre-treatment significantly induced GLT1 protein expression in cortical neuron (Figure 7, P = 0.031). Regional difference of GLT1 protein in neonatal rats among ceftriaxone treated and saline groups. Immunohistochemical staining of GLT1 in saline and ceftriaxone treated groups in P7 rat brain. (ceftriaxone: pre-treatment with 3 dosages of 200 mg/kg ceftriaxone, saline: pre-treatment with 3 dosages of saline). A, E: corpus callosum. B, F: cerebral cortex. C, G: hippocampus. D, H: striatum. Increased GLT1 protein expression in cerebral cortex was noted in ceftriaxone group compared to saline group. There was no significant difference in GLT1 expression in corpus callosum, hippocampus and striatum. Scale bar = 100 μm. In this study, we showed that neonatal ischemic-hypoxic brain damage can be attenuated by pre-treatment with ceftriaxone. Our data are consistent with similar approaches reported in the literature . However, the present study is the first to investigate the utility of ceftriaxone in a neonatal rat model of ischemic-hypoxic brain damage. Since ceftriaxone is a FDA approved drug and exhibits relatively few adverse effects, the potential clinical benefit of ceftriaxone and related antibiotics in human neonatal HIE warrants further investigation. For the pathophysiology of neonatal HIE, glutamate neurotoxicity remains an important issue in subsequent calcium influx, free radical formation, necrosis, and apoptosis . During brain development, glutamate plays an important role in oligodendrocyte maturation and myelination, but can lead to detrimental consequences from excessive release after HIE [29, 30]. The blockade of glutamate receptor by antagonists improved white matter injury [25, 31, 32]. Experimental drugs that block NMDA-type glutamate receptor could protect the brain from severe hypoxic-ischemic insults if given before or shortly after the insult, but were ineffective if administration was delayed for more than several hrs [33–36]. These data suggest that downstream events quickly become self-sustaining after neonatal HIE . An alternative approach to reduce glutamate neurotoxicity is to augment the glutamate reuptake. GLT1 glutamate transporter plays a major role in the reuptake of extracellular glutamate and is expressed mainly in mature astrocytes although minor expression has been found in neurons, microglias, and oligodendrocytes. But, astrocytes in immature human or rat brain do not express EAAT2 or GLT1 [37–40]. GLT1 expression is very low in the early postnatal period and reaches adult levels in hippocampus at 3-4 weeks old in rat brain tissue and hippocampus [16, 40, 41]. The roles of GLT1 in immature brain remained unclear. In human premature infant, expression of EAAT2 was observed in pre-oligodendrocytes which might be the cause of white matter vulnerability to HIE injury. Upregulation of EAAT2 (or GLT1) was observed in reactive astrocytes and macrophages in the area of periventricular leukomalacia (PVL) [38, 39]. In a rat model of neonatal HIE, altered expression of glutamate transporter and decreased GLT1 expression were observed in the area of ischemic core . Prolonged hypoxia reduced GLT1 expression in astrocytes resulting in the accumulation of extracellular glutamate . Furthermore, functional reversal of glutamate transporter in glial cells occurred during hypoxia and ischemia also contributed to the excessive extracellular glutamate toxicity . In this study, we used a FDA approved beta-lactam antibiotic, ceftriaxone. It has been found that a 5-7 days course of ceftriaxone increased GLT1 protein expression in organotypic spinal cord slice cultures, neuronal culture under glucose-oxygen deprivation, human fetal astrocytes culture, and in the rat brain . These results have been confirmed in hippocampal slice culture and in rat brains [27, 45]. In contrast, upregulation of GLT1 expression by ceftriaxone treatment was not observed in a rat stroke model, in organotypic hippocampal slices or in a mouse model of multiple sclerosis [16, 17, 46]. Ceftriaxone may offer neuroprotection via other mechanisms, such as increased GLT1 transporter activity, stimulation of neurotrophin release or reduction of T cell activation by modulation of cellular antigen-presentation [17, 46]. In our studies, GLT1 protein expression in the whole brain lysate of P7 rat did not change after ceftriaxone treatment. But, immunohistochemical study showed that pre-treatment with ceftriaxone induced GLT1 protein expression in cerebral cortex of P7 rat. GLT1 expressed in neurons of the brain is observed during early stages of development and is present during axonal growth, which disappears on maturation . The role of GLT1 in immature neuron remains to be investigated. In mature rat brain, neuronal expression of GLT1 protein and mRNA had also been found and might play a role in the pathophysiology of excitotoxicity [48–50]. But, in our study, pretreatment with ceftriaxone increased expression of GLT1 in the cerebral cortical neuron of P7 rat. Neuronal expression of GLT1 protein was confirmed after counterstained with Nissl stain. The presence of GLT1 in neurons might enhance glutamate uptake after hypoxic-ischemic injury. However, other mechanisms, such as enhanced GLT activity and/or anti-inflammatory effect of ceftriaxone, cannot be excluded. Several behavioral paradigms mimic the childhood behavior in human were examined in the young rat. No difference was detected in the primitive reflexes (cliff avoidance and negative geotaxis test) and motor function test among treatment, vehicle, and sham groups. On the other hand, significant improvement in step-down passive avoidance test was found after ceftriaxone treatment. The difference of behavior between HIE group and normal control group included long-lasting sensorimotor and locomotor deficits . But, unlike human, rats exposed to HIE injury did not exhibit gross motor function deficit in some studies although some permanent deficit has also been observed . This may be due to a higher degree of plasticity of neonatal rat brain compared with that of human brain. Step-down passive avoidance reflects learning and memory function. In our studies, ceftriaxone rescued hippocampal cells from apoptosis which may contribute to improved step-down passive avoidance results. Pre-treatment with agents prior to the appearance of pathological changes remains debatable in clinical application. But, in premature baby, pre-treatment may be acceptable because pregnant mother usually receives tocolysis for prevention of preterm birth. In addition, ceftriaxone exhibits antibiotic effect which could eliminate the pathogens if maternal chorioamnionitis is diagnosed  since ceftriaxone effectively crosses the placenta . 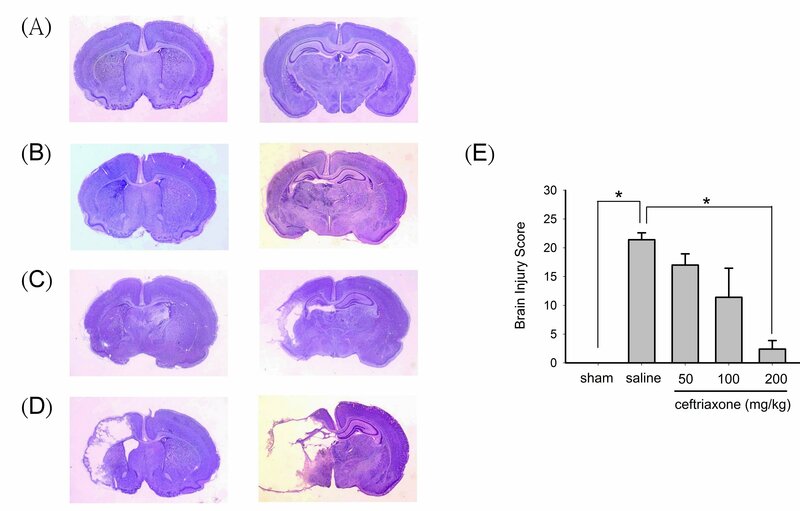 In conclusion, pre-treatment with ceftriaxone for 48 hrs prior to hypoxic-ischemic brain injury in neonatal rats reduced brain injury score, improved myelination, decreased hippocampal apoptotic cell death, and restored learning and memory deficit. Induction of GLT1 protein expression in cerebral cortex after ceftriaxone pre-treatment was observed in P7 rats, which might partially explain the neuroprotective effect of ceftriaxone. Ceftriaxone may be an effective therapeutic agent for the treatment of neonatal HIE. This study was partially supported by a grant (TCRD98-21) from Buddhist Tzu Chi General Hospital, Hualien, Taiwan. PCL and YTH carried out animal study, participated in the immunohistochemistry, performed the statistical analysis, and drafted the manuscript. CCW carried out the West blot. PJW and THC conceived the study, participated in its design and coordination, and helped to draft the manuscript. All authors read and approved the final manuscript.